We want ot thank you all for your support of We See It | Vol 6. The feedback has been wonderful! A big well done to all the contributors and readers! 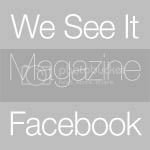 We would now like to open submissions for We See It | Vol 7, "The Fall/Autumn Issue". We would like to see art representing this season. Think dark berry colours, cosy fashion, firesides, back to school/university, long evenings filled with good company and good fun! Even though we have had some interviewees already involved, we hope to find some more artists to interview and some beautiful editorials and photostories! (illustration, design, photographics, fashion etc.) We would really love some Illustrators/Bloggers/ Writers and Designers to get in touch! Maybe you write poetry or short stories, if so, get in touch! We want to feature and interview all kinds of creatives. Please email us and tell us about yourself and what you do. Include a link to your portfolio. We pick out artist for "The Exhibition" pages through our Flickr Group! We will close submissions on August 30th - be advised that places fill up fast!